My good friend Emilia Hayati, who used to work in the resort of Salang, on Tioman Island many years ago came back spreading warmth with her personality and sunshine with her smile! Although she used to instruct here, marriage, motherhood and a move to Australia meant that she hadn’t dived for two years, so this was a perfect opportunity for my Divemaster trainee, Bryan Yap to practice a DM conducted program and refresh her diving skills. 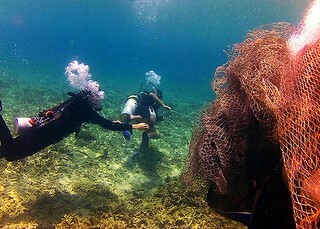 It turned out to be a huge fishing net that had recently drifted into the bay and got caught up on the reef. 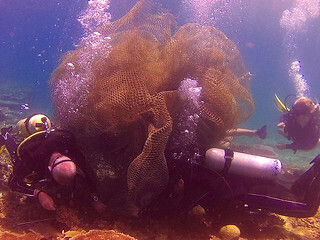 Emy and I started to gently free the net from the reef when she spotted a turtle trapped under the net! Operation turtle rescue had begun. I read somewhere that turtles need to breathe about every twenty minutes. We had no way of knowing how long the turtle had been trapped, so now time was of the essence. 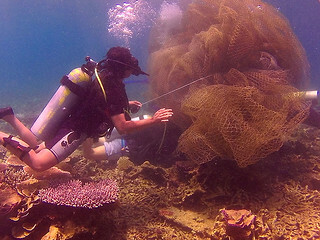 We not quite so gently lifted the net until there was a gap, the turtle spotted it and out he came and headed to the surface for that next gulp of life giving air. Amazing!! Awesome!! I can’t really find the words to describe how this event made me feel. Looking back I would now describe it as quiet satisfaction, but it was definitely more dynamic at the time! All in all it was a top day for all of us, but most of all for the turtle who had a very close call! Thank the heavens for that good visibility.